It's Friday, so it's time for another sketch. This sketch can easily applied even simpler than my sample card. It would also apply to something a bit more complex. To simple it down, you could make it a single layer with just stamped squares or circles. If you wanted to make it a bit fancier, you could have different types of embellishments in each spot. You could also make it into a pieced together mosaic, where you stamp on one larger square, then cut it up. It's up to you! 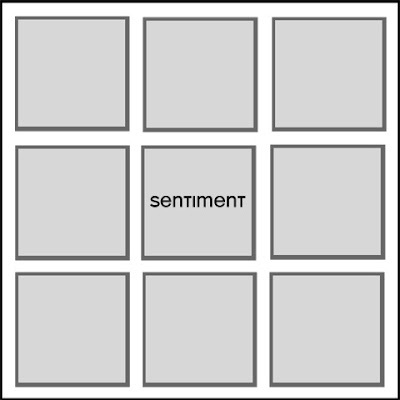 Each of my squares measures 1-1/4, with a 1-3/8 mat. This is so cute and humorous, I just love it! Actually I love all the cards you ladies post on this blog! BAHAHAHAHA! What a seriously cute card! Great layout too! Thanks for another fun sketch!! This was a fun sketch. Thanks. Sharing my contribution: Things I Love card! What a fun idea to repeat an image. 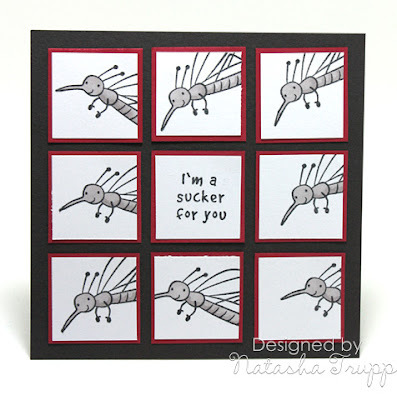 The mosquito card is so cute. Here is my card using this sketch. I love the simplicity and quilt look! Great sketch!! Here is my entry! Great sketch... I used it to create a layout! Ten Minute Monday - HB You Old Bird!